Today's festive mani is using Christmas Tree nail stencils from smART Nails. To create the Christmas Tree is a 2 step process. First you paint the Christmas Tree onto your nail and once completely dry apply the stencil on top to paint the stars. Apply top coat once the stenciled patterns are completely dry to avoid smearing of the design. There are 10 stencils per pack and you can reuse each one a few times. 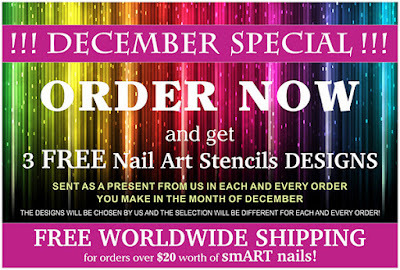 Stencils are a great way to create nail art. Simply peel off the stencil from the backing paper. The stencil is transparent so you can see exactly where to place it on the nail. Press onto your dry nail and make sure there are no air bubbles. To reuse the stencil I put the painted stencil on the plastic packaging the stencils came in, wiped the polish off with nail polish remover and it was good to use again. 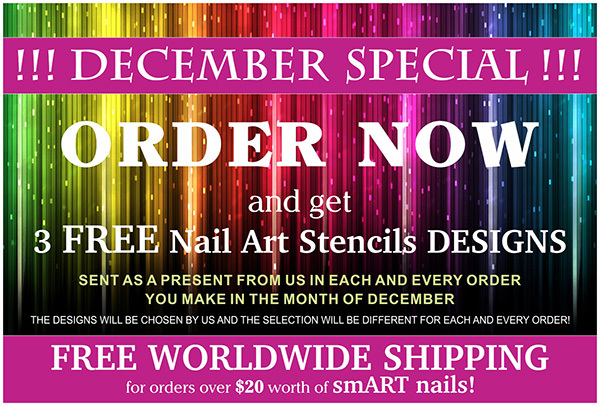 ATTENTION: 3 FREE PACKS OF STENCILS FROM smART Nails ON ORDERS MADE IN DECEMBER 2015 - HOORUH!